EA. Blizzard. Deep Silver. Crytek. Warner Brothers. All monied publisher-developers with MOBAs on the horizon. And above them all, unchallenged at the top table, sit Riot Games and Valve. Is there any room for a young indie studio with a fun idea to contribute to this most conservative of genres? Lightbulb Crew are about to find out. They’ve built a game named Games of Glory, and come armed only with ambition and a curious definition of the genre: “a mix of golf and Ultimate Fighting – and football”. Let’s talk tactics. Some of the biggest publishers in the world have hired teams capable of mimicking Dota, the Warcraft mod, and backed them with big marketing budgets. They know that if they can knock just a fraction of League of Legends’ playerbase loose from its servers, that’ll be more than enough to support a live game. It’s a straightforward, bludgeoning approach to business. Lightbulb Crew, a 20-strong outfit put together by an entrepreneur in Stockholm and a social games designer in Paris, don’t have that luxury. They need to be subtler. They certainly can’t afford to take Valve and Riot on at their own game. 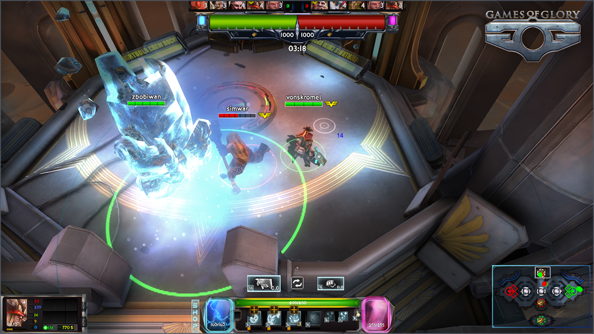 From the opening minutes of a match, in bird’s-eye view above an item shop, Games of Glory is recognisable as a MOBA. 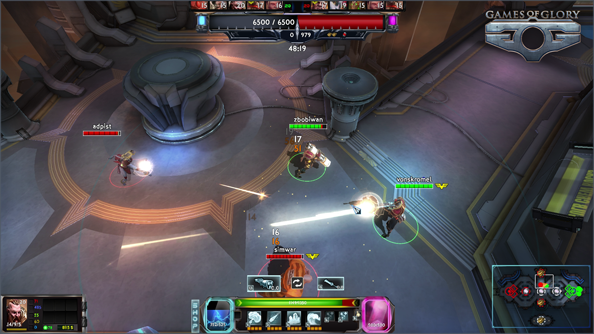 It is a game about working with a team of like-minded players to force your way through lanes populated by minions and turrets to an enemy base. But change comes in a tumbler-shaped receptacle on the UI, filled with an electric blue liquid. 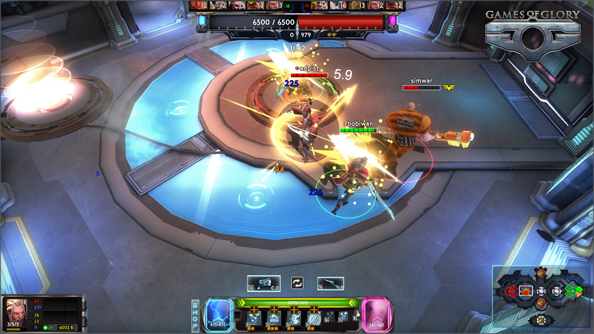 Games of Glory’s energy bar is just one of several callbacks to the hack ‘n’ slash genre. Ranged weapons consume energy in varying amounts – a rocket launcher, for instance, will drain your bar in one shot. 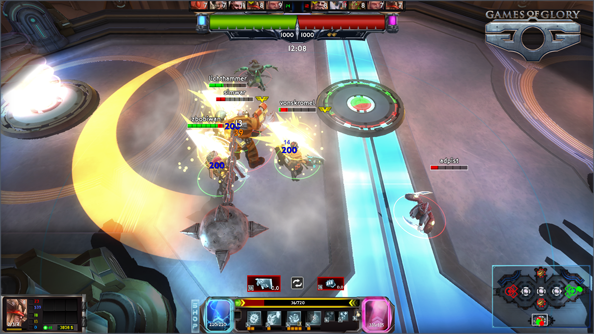 But close combat weapons use no energy, encouraging players to switch between and close the distance during encounters. “In League of Legends or Dota 2, you have a style that is very much a slower start, while we’re trying to really put people into the action immediately,” explained Larsson. Elsewhere, Lightbulb have upped movement speed, and let tanks be tanks – giving them plenty of hit points and encouraging them to put themselves in the way of other players. They’re convinced they haven’t lost the essence of MOBAs, but rather broken the genre down into its core components. Dota and LoL veterans will find they have “transferable skills”. It’s not just the UI that illuminates Lightbulb’s ambition, though. Throughout the hour I spend clicking ineffectively about Games of Glory’s sci-fi styled alpha map, Larrson makes tantalising reference to a ‘persistent universe’. When he finally opens up about it, I’m reminded of the weeks-long Warhammer campaigns that occupy teenage boys in Games Workshop outlets every year. All of the game’s action takes place in the arena – but the outcome of matches will contribute to an overarching story that will bring “real meaning” to what goes on there. “If you look at some of the other MOBAs, there’s a lot of history written about all the characters and the factions and so on, but in the end it has absolutely no meaning,” explained Larsson. 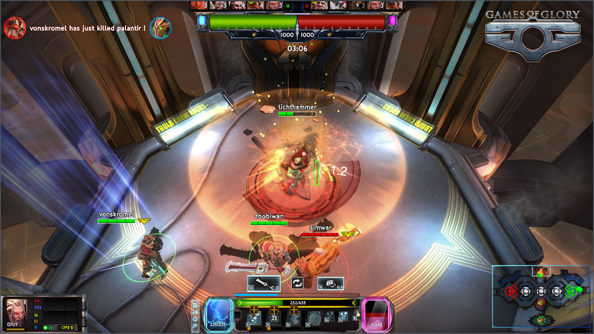 In Games of Glory, players can choose to support a faction, and have their kills and exploits influence the evolution of Lightbulb’s sci-fi universe. The game’s lore will shift according to each faction’s placement at the end of a story arc, and players will be rewarded with unlocked champions and weapons for their part in embellishing the story. Of course, there are some things thrown at the average MOBA-maker that Lightbulb can’t deftly sidestep or put a new spin on. Don’t make multiplayer games, Size Five’s Dan Marshall advised indies the other month. And Larsson is all too aware of the dangers of launching a competitive multiplayer game without an existing fanbase ready to populate its various maps and modes. 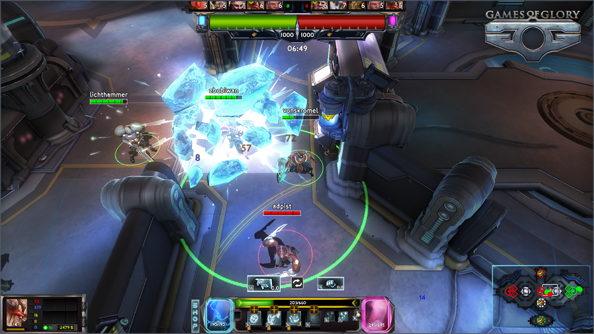 If a player logs on to find Games of Glory’s servers empty, they will likely never do so again. When the time comes, Lightbulb will engage in a “mathematical exercise”, to work out whether the game has enough players to support multiple maps – or whether they’ll have to be drawn from a random pool to ensure even distribution of players. That’s a problem others have solved before. But Lightbulb’s biggest potential stumbling block lurks among that same future playerbase – a monster that comes out after a long week or series of bad matches – and continues to bother the developers at the top table. Riot Games famously hired a cognitive neuroscientist and behavioural psychologist to sort of the toxicity in the LoL community, with mixed results. If the genre’s leading lights can’t fix that problem, how can Lightbulb possibly hope to build a positive atmosphere for Games of Glory? If Games of Glory competitors play nice for at least five matches, they’ll find themselves getting more experience and gold post-match. An MMO-inspired ‘social levelling’ system will grant players greater powers for good behaviour, and players will have individual reputation ratings determined by their peers. In all these ways, Lightbulb hope to make friendliness the norm – and toxic behaviour rare enough that players will report it when they see it. Games of Glory is not yet in a position to hoover up all those disillusioned players. 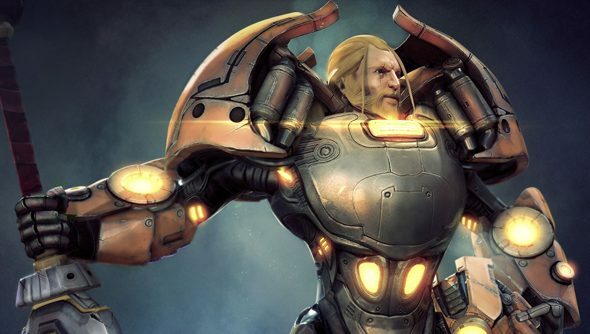 Its alpha map isn’t especially easy on the eye, and its planned payment model sounds almost too generous – reliant on champion and skin purchases even while allowing players to customise and play a broad subset of the game’s roster for free. But gosh, wouldn’t it be nice to see something new from the genre where golf, fisticuffs and football meet? Lightbulb are planning a Games of Glory closed beta for the end of summer, with hopes of an open beta to follow before Christmas.